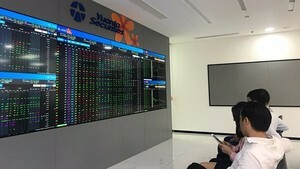 The southern trading floor flooded in red as the Vietnam’s benchmark VN-Index declined for ten consecutive trading sessions on May 25 as investors dumped shares severely to flee from the bear market. The shares of 284 companies and five mutual funds listed on the Ho Chi Minh Stock Exchange collapsed 4.03 percent, or 16.23 points, to close at 386.36 points, the lowest level since May 15, 2009. Of the index members, 23 climbed, 244 dropped, while 22 remained unchanged. Trading on the city bourse fell by 9 percent in volume and 5 percent in value over the previous trading session as 35.5 million shares changed hands at a value of VND673.87 billion. Saigon Thuong Tin Joint Stock Commercial Bank or Sacombank (STB) was the most active share in volume with 2.15 million shares changing hands. Saigon Securities Inc. (SSI), the country’s largest brokerage, followed with 1.63 million shares changing hands. Refrigeration Electrical Engineering Corporation (REE) remained at the third place with 1.37 million shares traded. Dong Hai Joint Stock Company of Ben Tre (DHC) shattered 12.24 percent to close at VND8,600. Construction company Lilama 10 Joint Stock Company (L10) retreated for eight straight trading sessions, demolishing 10.48 percent to VND9,400. The company will pay dividends for the year 2010 to its current shareholders in cash at a ratio of 7 percent on June 20. Cuu Long Pharmaceutical Joint Stock Corporation (DCL) diminished 9.52 percent to VND17,100. The company’s current shareholders will receive dividends for the year 2010 in cash at a ratio of 10 percent on July 27. Imexpharm Corporation (IMP) shot up 4.99 percent to VND40,000. Viet Thang Feed Joint Stock Company (VTF) surged 4.76 percent to VND15,400 after stalling for four trading sessions in a row. Ben Thanh Trading & Service Joint Stock Company (BTT) grew up 4.69 percent to VND20,100. The Hanoi’s HNX-Index of the smaller in the north free-fell for twelve consecutive trading sessions, slumping 3.99 percent, or 2.87 points, to close at 69.01 points. Trading volume lightly dropped over the previous trading session as 31.18 million shares worth VND321.26 billion changed hands. Meanwhile, the UPCoM-Index of unlisted shares shed 0.34 points to 32.48 points this morning. A total of 143,400 shares changed hands at a value of VND1.58 billion.